A running belt has become an indispensable piece of kit for anyone with even the most passing interest in personal fitness. When you think of all the gadgets we carry on a daily basis, it’s imperative for gym goers to get a place where they can store their items as they work out. But with a whole list of options to choose from and each brand advertising itself as having the best combination of security and comfort, it can be difficult to decide on a particular one. However, the good news is that you don’t have to spend time looking for the right running belt, thanks to this guide. Here are some factors to consider when choosing a running belt. How comfortable your running belt should be when purchasing, ought to be your first priority. If you’re after a tight fir, you can find belts in a tubular design. However, these types of belts can be restrictive to some body shapes. Others can stretch to accommodate bigger sizes by providing a secure fit for any shape. The way a belt is constructed and the materials used to make the belt is important. With a quality belt, you won’t have to worry about durability issues. Most manufacturers use breathable Lycra and ultra-thin mesh when making their running belts. The storage size matters depending on how many items you plan to take along on your run. 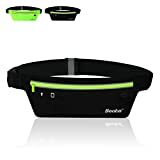 If you like listening to your music, getting informed of any emails, or carrying your water along, this will come in handy when choosing a running belt. Look for a belt with convenient storage and one that doesn’t compromise on the bounce. Being a streamlined and compact waist pack, the Nathan 5K running belt features a big interior pocket that provides enough space to put a few items while you’re on the run. This was among the first sports pack that was made particularly for runners. This belt not only reduces bounce from your pack while in motion, it also increases your comfort. 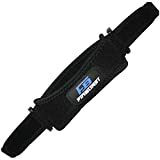 Made from neoprene material, the belt easily conforms to the runner’s body to reduce the annoying bounce and to allow you to carry any item you may need while out. The belt is also adjustable and also provides visibility thanks to the 3M Scotchlite reflective tape. The fitletic ultimate race belt is a popular choice among serious athletes. Made from neoprene, a moisture resistant material, this belt features a large enough pouch that can accommodate your electronics and keys. The interior pockets can easily fit your credit cards and I.D. With six slots available, you can easily access gels and fuels. The reflective front strips ensure that you stay safe even when running at night and the race toggles hold race number bibs. If you’re after convenience and comfort, the Fitletic belt is an excellent choice. 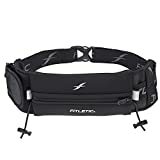 This hydration belt for running is ideal exercise belt that gives you ample storage for credit cards, cash, and other necessities that you may want to take on your run. Featuring a straightforward, sleek design, this belt is lightweight and comes with two ten ounces BPA free and leak proof water bottles for long run. The moisture resistant fabric also has a vented strap with earbuds that provide easy access to audio ports. 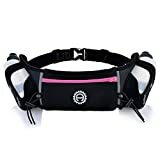 If you’re looking for superb quality, comfort, and protection of your items, the Hydration Belt for running will not disappoint. Featuring an adjustable waistband able to fit a size 27 up to a size 47, the Zikee hydration running belt provides a practical, yet convenient option for runners. Being made from neoprene, the hydration waist pack fits snugly and provides stability. Available with BPA free water bottles, the hydration running belt is worth every penny. 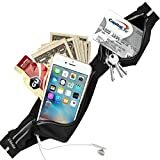 The FinBurst Running belt is designed to fit your smartphone and other necessities like credit cards and keys. The best thing is that this belt is not just for running as it can be used for cycling, fitness, camping, walking, and jogging. Featuring an adjustable belt size, the FinBurst hydration belt is made of weather resistant material that protects against external moisture. FlipBelt is one of the most popular brands on the market. The USA designed belt features a new design with 4 sizeable pockets made of a sweat resistant material. Additionally, available in a range of colors, these belts remain visible even during nighttime. Moreover, the belt is available in 5 sizes and the lira material comfortably accommodates any body type. Enjoy the machine washable fabric that is lightweight and breathable. If you’re looking to pay extra for a superior product, this should be your go to choice. The Becko lightweight running belt stands out for its convenience and lightweight construction. The belt has mesh material; that keeps your skin comfortable while on the move. Additionally, the side pouches are waterproof meaning that you can carry your water without any worry. Moreover, find the zippered pocket that gives you enough space to store your essentials. Being uniquely designed with high-quality materials, you’re assured of a durable and long-lasting running belt. The Ushake Running belt is built with efficiency and comfort in mind. Whether you’re preparing for a long run or just going on a few miles, you’ll love the mesh panel that is made to conform you your body for added comfort. Being light in weight, the Ushake running belt provides a bounce-free experience and the dual compression allows for a breathable fit. If you like having enough room for your personal items and water, check out the running hydration belt featuring a reflective waterproof gear. Featuring a pouch big enough to have a phone, you can enjoy your music while on the run. With the ability to fit up to size 43, this belt comes with straps that provide an adjustable fit, The side elastic straps can hold your race and key bibs. You don’t have to worry about bouncing with this running hydration belt. Being light in weight, the belt is hardly noticeable. Available with ideal size water bottles, you’re assured of enough water even during a long run. Featuring a long 7.5 inches storage pocket, the Bringit Running Hydration Belt provides enough space for you to pack in everything you may require. For the long run, you can have two ten ounces bottle rest on your sides. The headphone hole allows you to access your music and the zipper placement keeps your iPod in place. The adjustable strap can fit a size 25 all the way to a size 40. The best thing is that it can stretch to about 47 inches. Enjoy the gel-based interior which keeps the belt from bouncing. If you’re seeking a secure fit with enough storage, you Bringit hydration belt should be your first choice.